I'm so honored to bring to you today a fun collaboration I did with La Mer watches. I'm such a huge fan of their watches that when I was asked to wear one of their pieces, I jumped at the chance! This Austin-Crystal/Stones wrap watch has a beautiful mint-colored long leather strap layered beneath a brown leather strap. It's also paired with African turquoise stones and stands of Swarovski crystals. Instant arm-candy status! Because of the beautiful color of the leather, I paired this look with a simple skirt and t-shirt combination. The orange from the skirt helps make the watch pop even more. I have worn this watch a lot since I've received it and people can't help but check out the intricate details. To see my feature, check it out here! So many beautiful accessories in this post! I have a La Mer watch too and I love it. The wrap detail is the best. Love your look!! Particularly the green stones necklace!! I love this look. 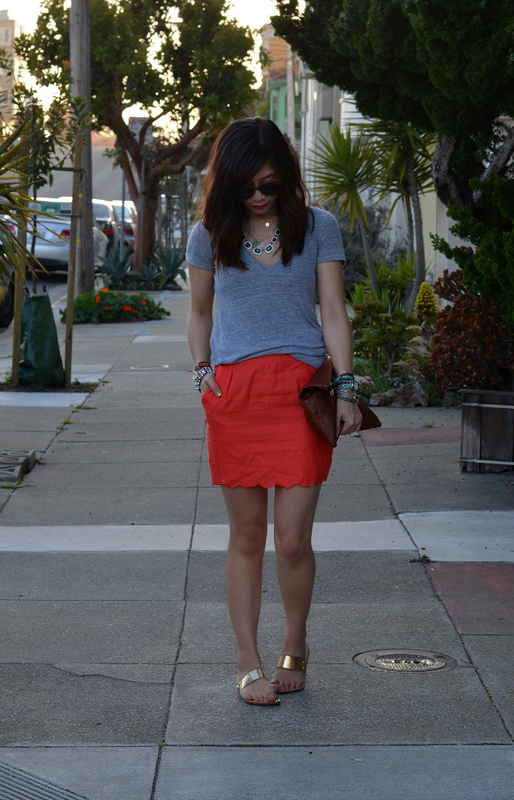 The color of the skirt is so bright and fun and your accessories are fantastic. :) Hope you had fun! Ok, that picture with your neon nails, awesome arm party, and yummy macaroons is just begging to be Pinterested and Tumblr'd forever. And I am happy to get that started! Love the scalloped skirt! And that watch is awesome! 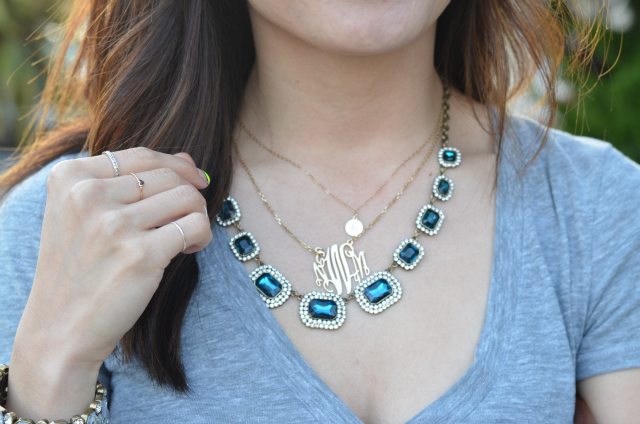 Love the jewels attached to it and the color is so fun! Perfect for summer! I love this entire looks from head to toe and that skirt is so freakin cute! I'm a huge fan of La Mer watches - I stocked up on 3 during the Target collab :) Hope you had a great weekend doll! love those gold sandals u look amazing! xO! Love your look. Very comfortable, but all the baubles take it to the next level! LOVE this!! I could definitely pull this off and it looks so cute on you. Love all the bracelets. Yay, congrats! I absolutely love this outfit... that scalloped skirt is pretty amazing! LOVE your watch. And love your scalloped skirt, so cute! LOVE ur skirt and accessories!! super cute outfit!! Obsessing over this skirt. And all the amazing gold accents! loving this casual look and the pops of color here and there! You are the cutest! Great watch and such a cute skirt. I love the scalloped detailing! So cute! Such a cute look- and it looks like such a lovely day! Loving all the layered jewelry! This is such a cute and fun, but simple outfit. Love how your styled that grey t-shirt! Always perfection Nancy. What a fun statement piece! What fantastic arm candy....nailed together by that lovely watch!!! love this look dear ! the skirt and the sandals are fab ! Thats such a pretty skirt, I particularly love your savvy styling of this outfit, great accessories! love everything about this outfit! their watches are so fantastic and your nails are super fun. you look fabulous! This is an adorable outfit! Perfect casual outfit, I need to PIN this asap! What a fun collaboration this is! I have never heard of La Mer, but oh my gosh their watches are fantastic. 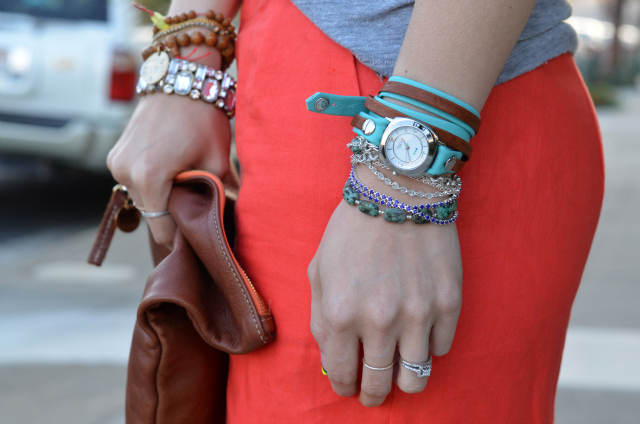 I love how you've accessorized this outfit! That skirt is SO way cute. I love this look, and I have to go check out La Mer immediately. I love your watch! Love La Mer watches! Looking fabulous!